Service dogs come in all shapes and sizes. Not all service dogs fit the mold, but they make just as much of an impact on the lives and people they serve. Meet Buttercup, a 3 year old pit bull. Buttercup was rescued by Paw Prints in the Sand from San Bernardino City Shelter the day she was scheduled to be euthanized. She was emaciated, suffered from pneumonia, and pregnant. After a failed adoption, Buttercup was returned to the rescue and enrolled into a training program at Redefined Dog Training. 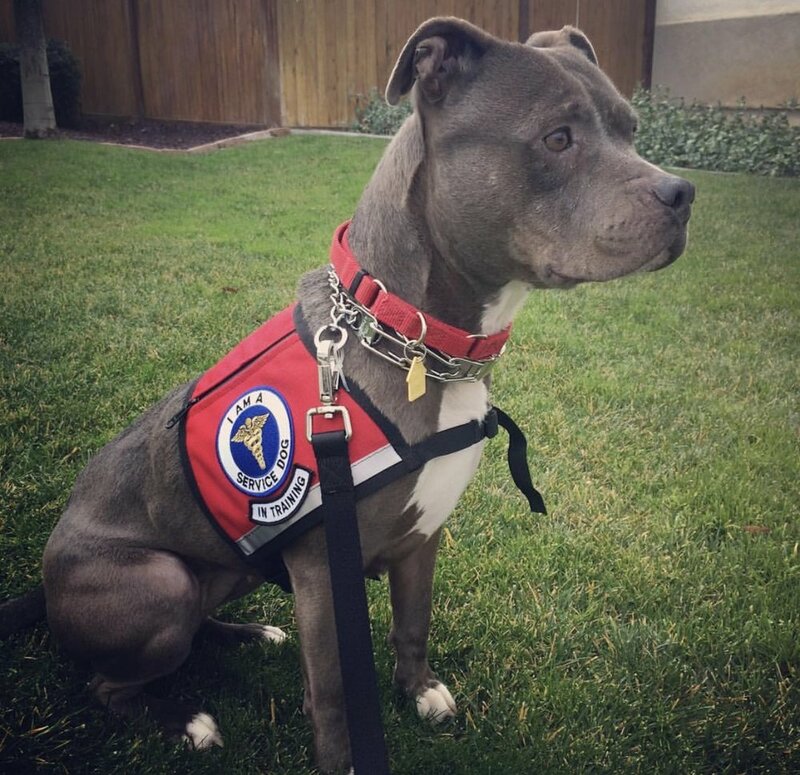 While in training, the rescue was contacted by a family in need of a stability/service dog for their daughter Jordan who suffers from Dysautonomia, POTS (Postural Arthostatic Tackardia Syndrome) and Ehlers-Danlos syndrome (EDS). These conditions cause Jordan to be very unstable and run into things. She needs assistance getting up up from a seated position. She also faints, has blackouts, seizures, severe anxiety and dangerous drops in blood pressure for no apparent reason. Buttercup was trained with the basic commands of ‘heal’, ‘stay’, ‘leave it’, and ‘down’. Her trainers also taught her additional commands that cater to Jordan’s needs. They taught her to pick up the leash, which is very important because Jordan cannot bend down and pick something up without falling. Being a teenager, Jordan expanded this command to picking up anything Jordan drops, opening the door, and even taking Jordan’s socks off and handing them to her. The 'back up' command is also important. Normally, a dog would turn around to avoid a door, wall, or curb, but turning around would cause Jordan to become unstable, so Buttercup will back up rather than turn. The ‘focus’ command is used to refocus Buttercup and let her know she is still working. The ‘block’ and ‘cover’ commands make Buttercup a physical barrier between Jordan and the ground or other people. It helps to give Jordan a type of base. If Jordan feels unstable, she can use one of these commands and lean into Buttercup, and Buttercup will help stabilize her. Buttercup also helps Jordan walk straight and prevents her from walking into objects and areas that could harm her. If Jordan is about to have a seizure or faint, Buttercup will alert her and take her to a supervising adult. If no one else is around Jordan at the time of these episodes, Buttercup will guide her to sit in a secure area. Buttercup will lie on Jordan until the issue passes. Her trainers also taught Buttercup to alert Jordan and an adult if Jordan is about to have a seizure, experiences a change in heart rate, is about to black out, or lose hearing or focus well before Jordan has shown any signs, making it possible for her to address the issue or get to a safe place before they happen.